We know you have a hectic schedule, because who doesn’t these days? To help you fit quality dental care into your busy routine, Dr. Cheng, and Dr. Thorburn have invested in state-of-the-art CEREC technology that can create custom dental crowns in about an hour. Now, instead of making two visits to our office and waiting while a dental lab produces your crown, you can come in on your lunch hour and leave with a beautiful, permanent restoration for your broken or severely worn tooth. With CEREC, you get the best when it comes to quality and speed at the same time. CEREC actually stands for Chairside Economical Restoration of Esthetic Ceramics. Despite being somewhat of a mouthful, how CEREC works is actually quite straightforward. CEREC uses a 3D image of your tooth created by a digital scanner to custom mill an attractive restoration from durable dental ceramic using CAD/CAM technology—all in-house! Because we produce CEREC crowns, inlays, and onlays in our office, we can immediately place them, restoring form and function to your damaged tooth in just about an hour. Millions of people across the globe have benefited from this high-quality, time-saving technology, and you can, too! If you’ve been dealing with a compromised tooth and haven’t had time to get it fixed, now you can get a quick and effective solution without having to sacrifice anything. And we do mean anything. CEREC crowns actually cost about the same as traditional lab-made ones. That means you can enjoy all of the benefits when it comes to speed, quality, and convenience without having to break the bank. Thanks to CEREC technology, now even more people can fit their essential dental care into their busy schedules. Complex restorative care can now be completed in just an hour or so as opposed to being spread out over the course of a few visits. You simply come in, get your smile restored, and that’s it! They can be designed, milled, and placed in about an hour. You just sit and relax in the chair the entire time! 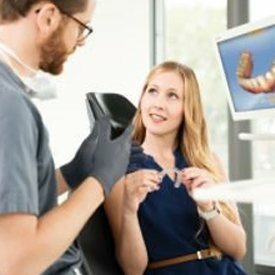 The impression of your teeth is taken using a digital scanner, which is not only more comfortable than a traditional putty one, but more accurate as well. CEREC crowns have been shown to have a 95.5% success rate after 9 years. At 18 years, 84% of CEREC crowns are still successful and functioning. They take at least two visits, if not more, to the dentist’s office to complete. They require an impression to be taken using dental putty, which is very unpleasant for many patients. While a crown is being made at a lab, a patient will need to wear a temporary one, which have a tendency to break and fall out. Traditional crowns have an average lifespan of about 10 years. They can be made from a multitude of materials, some of which are very unnatural looking. Your dentist will remove the decayed or damaged portion of your tooth and shape it to fit the crown. He will then use a high-resolution digital scanner to create a 3D image of your tooth. This design will be given to CEREC software in order to design the crown. This design will be given to our in-house milling machine to fabricate the crown from a block of dental porcelain. Your dentist will then place the crown and make any final adjustments. After that, you’re done! It’s just that easy. Ready for the Next Generation of Dental Care? Come experience progressive, state-of-the-art, patient-focused dentistry. Call our Fort Worth dental office today to schedule your one-visit CEREC appointment with Dr. Cheng, or Dr. Thorburn. Our practice happily provides quality care to residents of Burleson, Crowley, Aledo, and the surrounding areas.